I think tha many of us have units (infantry battalions & cavalry regiments) that can't be finished as only few figures miss to complete such units. Since I'm npt willing to buy an entire new set to remain with a lot of useless soldiers, I wonder wether some retailers, selling single plastic soldiers (may be for an understandable higher price) do exist. I,m sure someone here can help if you have a wish list. In particular I have to finish an Austrian Landwehr battalion, for which I need three marching figures, and a Grenzer btg. where I need seven soldiers with levelled muskets. I attach an explicative illustration. I would be grateful if any of you could help me. Sorry not in my collection. Hey Giovanni, I have some in my collection. The marching ones will be no problem, the ones with the levelled muskets is something different. Just send me a PM and we work something out. A picture of PSR of the figures you want would be a great help. I apologyse for my ignorance: what do you mean with PM and PSR ? 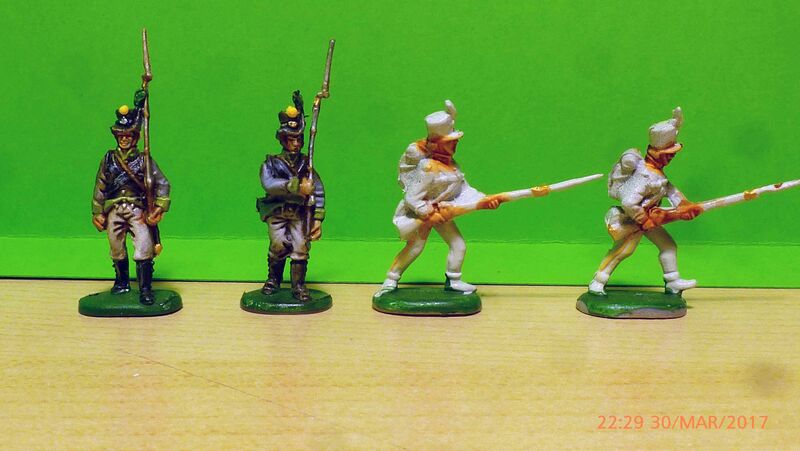 What I need to finish my Austrian Landwehr battalion, is a total of three marching figures in either of the two poses shown in the picture attached to my message of 10 May 2017. I thank you in advance if you can help me, and let me know if I can do something similar for you. I haven't received any recent comments from you on my latest presentnations. Hi Giovanni! I was probably lazy, or missed them. Both happens quite regurarly.